I have to admit, it’s been a while since I’ve been super stoked to review a product like Stark Mobility’s Starkboard. So when it arrived at our office, it was like I was a kid on Christmas again. It was out of the box and rolling through our studio space within minutes. Luckily the batteries had enough juice to get up to speed in no time. Of course, getting up to speed on learning how to ride this thing took a little longer, but after about 5 minutes of practice I was ready to take it outside and really see what it could do. Starkboard was a fully funded project on Indiegogo on December 9, 2017 and is now ready for purchase for everyone. So is it worth it? In short, yes! But before you whip out that credit card, here’s the breakdown on my 4 weeks of testing. 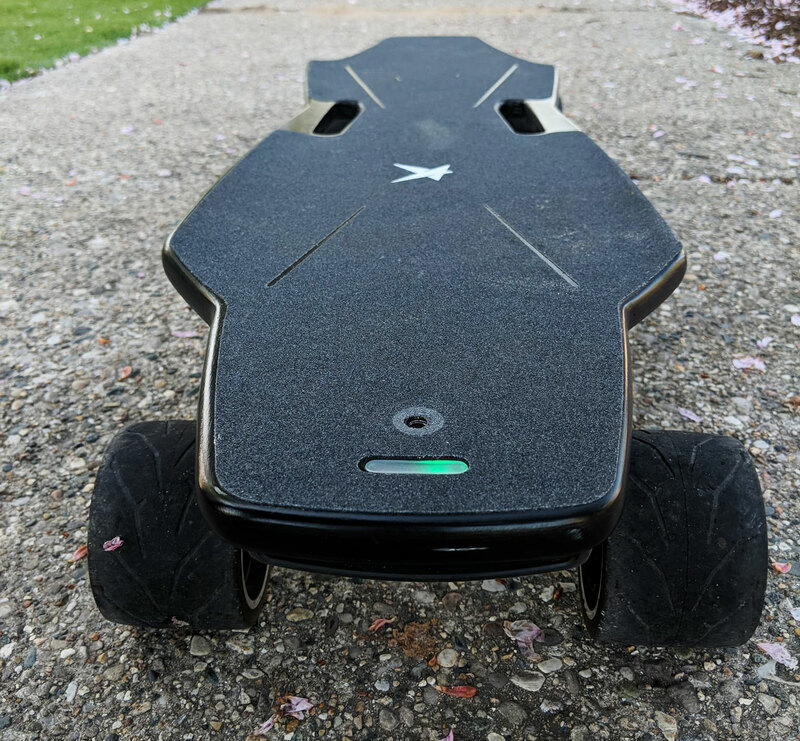 Starkboard is one of the very few electric skateboards on the market right now that doesn’t require a remote, making this thing truly “hands-free”. Even more, it is the only one on the market (as of today) that doesn’t require “footpads” or special foot placement in order to work. This feature allows you more control on position so you can get as comfortable as you want while riding through the streets. The deck is made of 7 layers of Canadian maple plywood and 3 layers of fiberglass so it has a solid stiff feel with little flex. There are also 2 handle cut-outs on both sides of the board that make carrying the 17.4 pounds around much easier. On the flip side, the battery is removable so you can easily swap it out with a fresh one and continue on your way past the 12.4 mile range. The wheels are extra large (90mm) and contain two powerful hub motors in the back wheels (2-wheel/rear wheel drive). They are solid wheels that have been able to ride over rougher pavement, carpet, and compact gravel. The rougher the terrain, the more you’ll feel the vibrations and it isn’t pleasant. I took some rough streets to work the other day and my legs were tingling by the time I stepped off. However, it did handle it. But it is a much better ride on smoother pavement and way more enjoyable. On the front and back you’ll notice some bright LED lights that are great for visibility at night and to signal if something is wrong. I live a couple miles from the office so this has now become my main transportation vehicle. I typically get a few days out of it before I need to charge it. The first time it warned me that something was off was when the battery got to about 35%. The front Led turned red and it started beeping. I needed to feed it some juice, but it was nice getting a little visual and audible reminder that something was up before it was too late. I did find out the hard way that once it reached about 25%, the speed and handling became a little erratic. It took me by surprise and stopped hard, making me leap forward off the board. I caught myself in time so I didn’t eat pavement, but I ripped the top of my shoe up pretty bad. Just do yourself a favor and keep it above 25% until they work out the bugs on that end of things. As sweet as the design is, with a product like this… it really comes down to performance. The main selling point for this board is that there is no need for a remote. You are the remote! Starkboard uses “Posture Control” that utilizes a motion control system that is based on intelligent weight and motion sensors. Lean forward to accelerate, lean back to slow down and stop. Hands free so you can really enjoy the ride. As I mentioned above, the battery life lasts a couple days for me as I ride a couple miles on average per day. I did notice that as the battery gets discharged, it becomes noticeably slower. Once the battery is fully charged, I could feel the zippiness once again. The range they advertise is pretty close, but you’ll want a second battery if you want to go past 12 miles and still have the juice to go fast and get back home. As far as rideability goes, it takes some getting used to especially when going over bumps or carving around corners. Our tendency to lean back when banking around corners or bumps directly effects the weight distribution and motion control sensors, which then decreases the speed accordingly. This is something you’ll need to get used to or make sure you counter by really leaning forward into your desired path. Having an optional remote for these conditions would be nice, but once you get used to how the sensors work and really adjust your weight accordingly, it does make for a really fun “hands free” ride. “The charge port is actually waterproof and the electric current is only activated from the outside source. However you are right when if comes to debris, and we did have several ambassadors ask about the same thing. And thus going forward all boards will have a similar silicon cap as the battery charge plug. If you remove the battery pack you will see what I mean. Anyhow I hope all is working out great with the board. Let me know if you have any other questions or need help with anything.” So looks like that should be solved by the time you order one. For now, I’m just using a strip of electrical tape to keep things tidy. As far as rougher terrain goes, the board has been able to handle it pretty well. I have noticed some squeaking noises coming from the wheels after some heavy vibrations down a couple nasty roads, but it has held up just fine these last few weeks. Hopefully it will continue to prove its durability in the coming months/years. 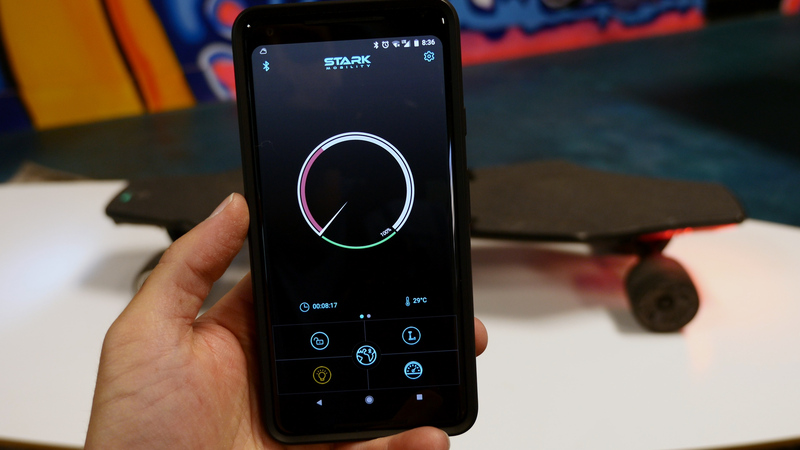 Since there is no actual remote needed for the Starkboard, there is an app you can download that allows you to connect via bluetooth to adjust settings, monitor speed and gps, as well as do firmware version upgrades when available. The home screen has a simple layout that displays a circular gauge that shows your speed and battery level. There is also a temperature gauge and time clock. There are several other buttons on the home screen that allow you to lock or unlock the board, turn the lights off and on, adjust speed level (beginner, intermediate, and expert), launch a map that tracks your path and speed, and manually set the speed using a slider control. In the settings panel you can adjust the “Timing Shutdown” (10-120min), do a Vehicle Self-Inspection (checks hall sensor, quiescent current, electric circuit, sensor communication, battery voltage, and gyro), check battery info, do a version upgrade, calibrate board, and even control the board remotely. Currently, the Remote Control feature is disabled as soon as you step on board so you can’t control it while actually standing on the board. It only works while there is no heavy weight on the board. Hopefully this feature can be adjusted in the future to allow the option for a remote control, or have the ability to add a separate remote trigger if one chooses. The great upside for the App’s Remote Control feature is the ability to use it as a camera dolly, which we have done… a bunch of times already! Works perfect for 360 cameras! 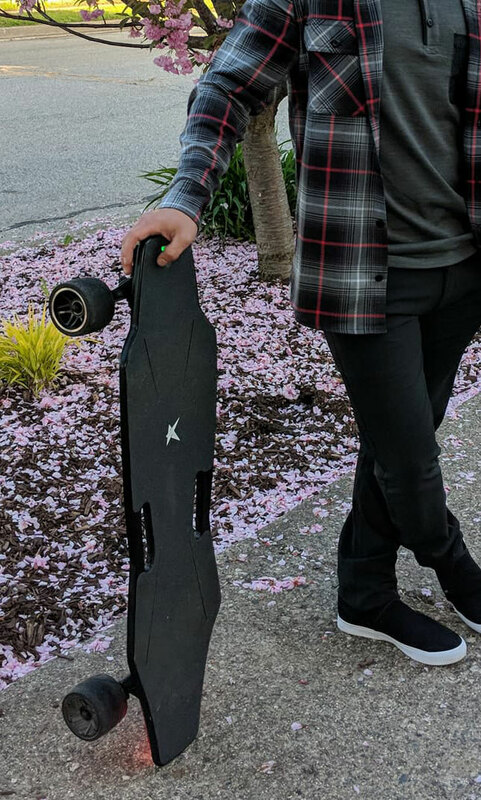 Overall, the Starkboard is a great electric skateboard that has a ton of features for under $1000.00. I know it was designed as a simple commuter board, but hopefully they allow for speed advancements that can match the electric motors on board for those of us looking for more speed. Also, if they add the ability to use the phones remote or add an optional trigger remote if one chooses, then they would be offering more options than what’s currently on the market today. The price has fluctuated a little bit since we received our board, but right now you can save 30% and put an order in for July for $699. Not a bad price, especially when compared to anything equivalent on the market right now. We are very pleased with Stark Mobility and look forward to seeing them evolve this board in the future, and see what else they come up with! The Starkboard is the best "non-remote" electric skateboard we've tested at a price that is much lower than anything else comparable on the market today. Definitely a great board if you're looking for your first buy. Remote Control feature is only usable when not on board.  Awesome review. Just got my starkboard 2 weeks ago and is awesome. Very easy to get use to it, pretty fast and super responsive. I will get an extra battery to double my range, haha. I got it two weeks ago and I am already having issues. it won’t stop beeping. it is hard to break and it doesn’t work backwards anymore. I just started having the same issues. I feel your pain. Waiting for a response from their support to see if there is a fix coming. Hopefully there will be a firmware upgrade soon! I’ll keep you posted when I get an update. I have also issues with the board. I cannot drive off. The board beeps and stands still after 2-3 meters. The diagnostic function shows no problems. Now waiting for a response from the service department. It seems the quality of the board is very low. There was also no charger in the box and I had to buy my own. At the moment, not really excited and happy with the board. Hope, things will get better. Mine arrived six weeks ago, without the extra battery I paid for. Out of the box it went 5 blocks and then stopped. L.A., CA support person Lucian says its one of the motors, according to the app. Sofar only a sad story. Bottom line is I have a nonfunctional board, an unhelpful startup company, and am out $749. I had to wait six months after payment to receive it. And now this.